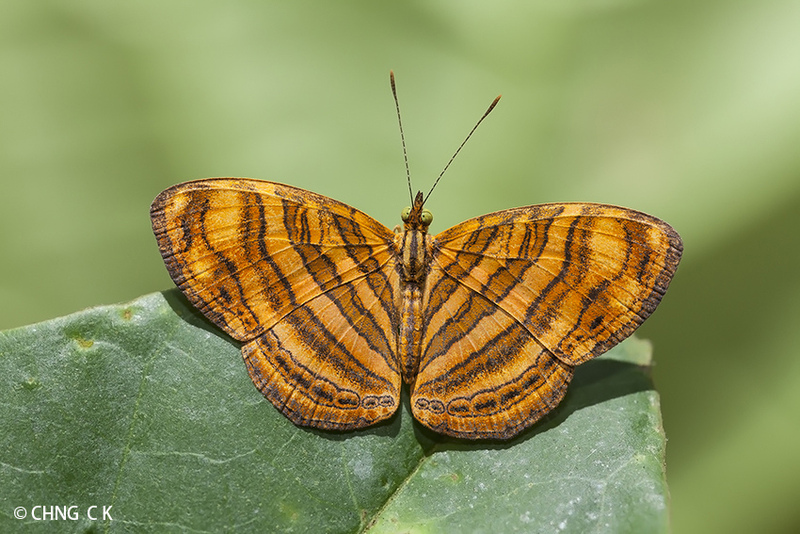 This small butterfly is forest dependent and rarely strays outside the sanctuary of the nature reserves in Singapore. It has a habit of flying and then perching under a leaf with its wings spread open. It is usually skittish and is difficult to photograph (due to its behaviour of hiding under leaves). It is the only representative of the genus Chersonesia in Singapore. There have been records of other related species of the genus in Singapore, but none have been reliably seen in recent years. The life history of the Little Maplet has been successfully recorded on the fig Ficus aurantiaceae (Orange Fig) here. This individual was photographed by ButterflyCircle member Chng CK last weekend in the nature reserves. What is unusual about this shot, is that the Little Maplet was sunbathing on top of a leaf rather than displaying its usual behaviour of hiding under the leaf. The butterfly has also been observed to puddle amongst the leaf litter on the damp forest floor, and occasionally feeding at flowering forest plants.